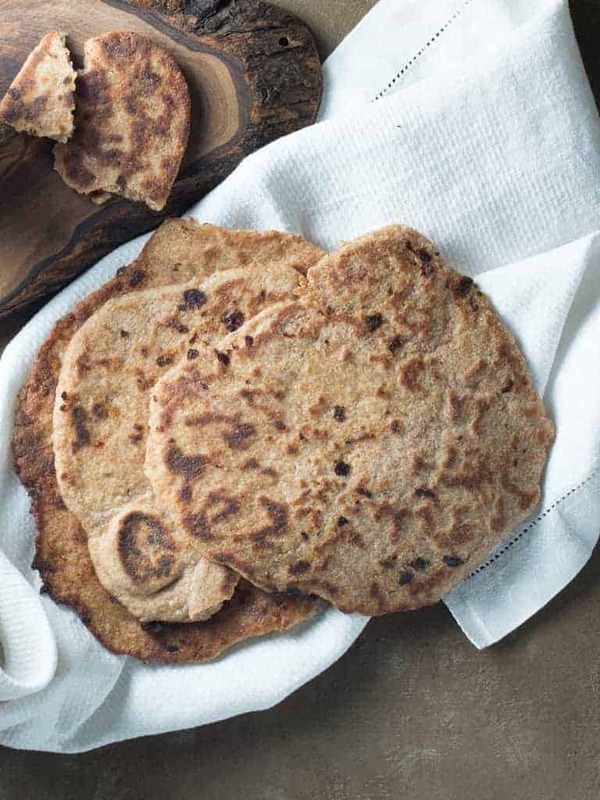 This soft chewy whole wheat naan recipe makes a healthy authentic old world bread. I freshly grind my wheat and do not use any white flour in the recipe. Using 100% whole wheat packs the nutrition of all three components of the wheat kernel. The outer rough layer of the grain, the bran, is valuable for its fiber; the wheat germ of the seed is high in nutrients; and the majority of the grain, called the endosperm, is a source of good carbohydrates. Traditionally, naan (pronounced nahn ) was leavened by airborne yeasts and baked in a tandoor oven. Slapped on the hot side of the oven, naan puffs, browns and takes on a smoky flavor, all in about 60 seconds. In my more modern kitchen I used a non stick pan heated over high heat. 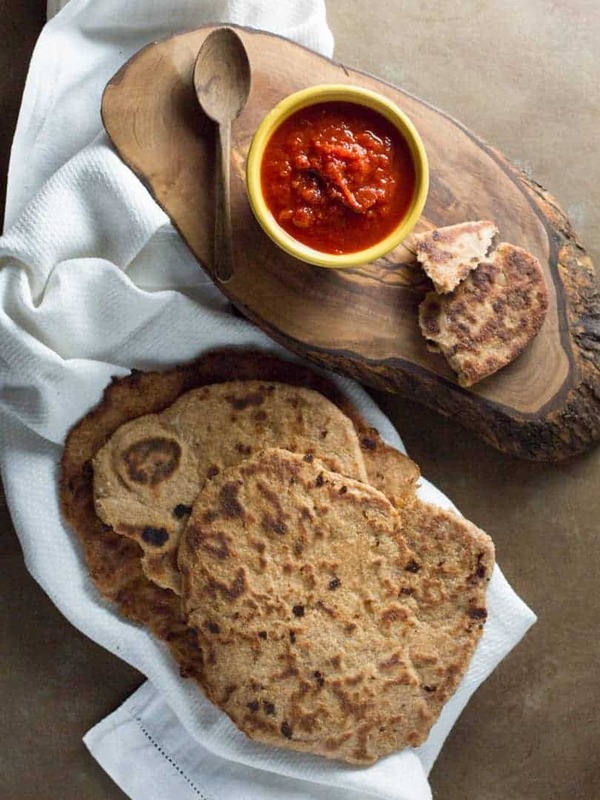 Typically, this whole wheat naan recipe is served hot and brushed with butter. It can be used to scoop other foods such as my Roasted Red Pepper Spread recipe or served stuffed with a filling of meats and vegetables. 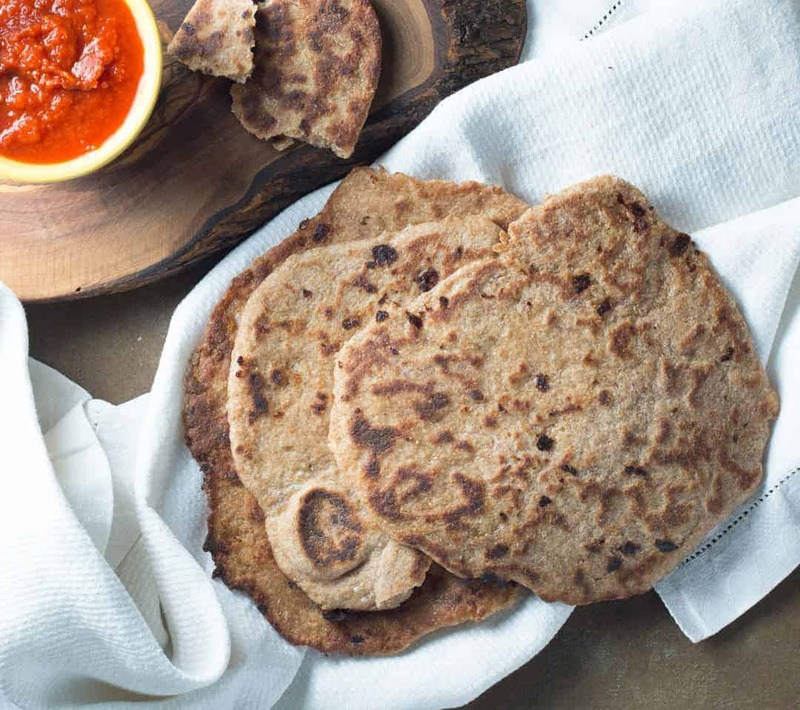 100 % whole wheat naan is a healthy and authentic old bread recipe great for dipping or filling with meats and vegetables. Roll each portion of dough into a ball, dusting with flour to keep them from sticking. Repeat cooking the remaining dough balls in the same way.